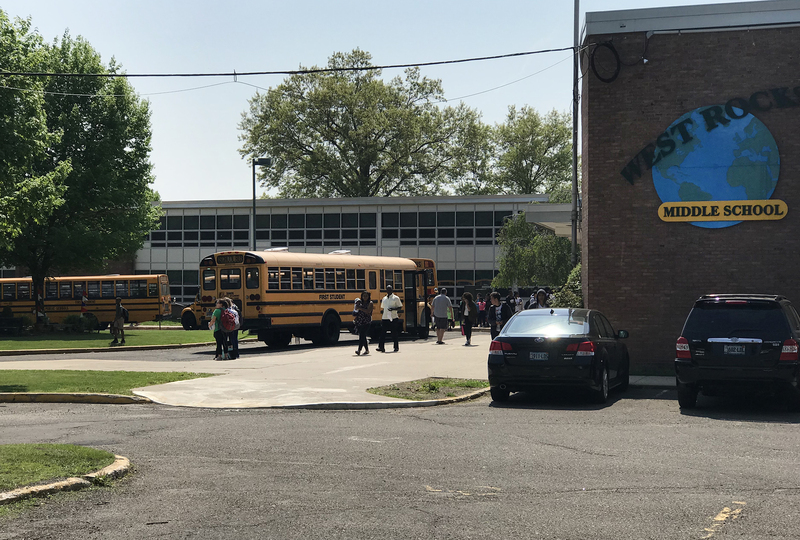 West Rocks Middle School is not available for the Aug. 14 primary due to the ongoing window replacement project, officials say. The Planning and Zoning Department, the Health Department and the fire marshal’s office are talking about doing joint inspections on suspected illegal apartments, Planning and Zoning Director Steven Kleppin said Monday. The fire marshal has authority on buildings that have three apartments or more while P&Z has very little authority to enter a building and would be “almost a guest on the inspection,” he said, to Common Council members gathered to consider Mayor Harry Rilling’s proposed reorganization. Each department has a different authority to bring enforcement. Some can be proactive, others must go through “more of a process,” Kleppin explained. A building with two apartments is a different animal, as P&Z needs proof of an illegal apartment to be able to do an inspection, he said. Proof must go well beyond a complaint of too many cars in the driveway or people coming and going. If Zoning gets a complaint, a letter will be sent explaining that a complaint has been received and asking to do an inspection, he said. The best evidence is a real estate ad advertising an apartment, as P&Z can seek an administrative warrant but a judge will want proof, he said. Rilling commented that the city is adding a fire inspector and hiring two retired fire marshals who are still certified by the state to conduct inspections two or three times a week. Coordinating of inspections is not yet underway because it’s become more problematic recently based on zoning definitions on some of the properties that have come up, Kleppin said. Republican gubernatorial candidate David Stemerman pitched himself Wednesday to the Norwalk Rotary Club. Stemerman touted his status as an outsider and an entrepreneur who overcame a horrific challenge to succeed with his small business. Connecticut needs tax cuts, a reduction in the number of tax brackets and elimination of estate taxes and business entity taxes, Stemerman said, asserting this would be paid for by privatizing and prioritizing, and changing employee contracts. People are stuck in traffic and trains are slower today than in 1970, he said, promising to attract private investments and add lanes to Interstate 95 and reverse them during rush hour, turn Sikorsky into a major regional airport and improve train service. Stemerman also said he would support a state law that was passed in 1991 that effectively made Roe v Wade state law, if the U.S. Supreme Court overturns Roe v Wade. Stemerman is one of five Republicans seeking to win their Party’s primary on Aug. 14 and become the endorsed candidate for governor. Danbury Mayor Mark Boughton won the Republican caucus and is being challenged by former Trumbull First Selectman Tim Herbst, and businessmen Steve Obsitnik, Bob Stefanowski and Stemerman, who have never held elected office. Norwalk voters who try to vote at West Rocks Middle School on Aug. 14 will discover that the school is temporarily unavailable for voting. West Rocks Middle School is unavailable due to ongoing remediation work, so primary voters will be sent next door to All Saints Catholic School, Democratic Registrar Stuart Wells said Tuesday. “Voting will be in the lunch room (cafeteria) with parking and entrance in the back — there will be signs, of course. As you know, All Saints is basically next door to West Rocks, so there should be little or no inconvenience to voters,” Wells wrote. The location change is just for the primary, not the general election. District 142C votes at West Rocks, according to a map on the City’s website. Because asbestos and PCBs (Polychlorinated Biphenyl) are involved there are strict regulations, Wells said. Norwalk Police Lieutenants Terrence Blake and Officer Christopher Kassimis responded to a report of an unconscious person who was not breathing on June 22 and quickly determined that the person was suffering from an opioid overdose, a press release from the NPD said. The Norwalk Police Department has named Blake and Kassimis as June 2018 Officers of the Month. process for illegal apartments as part of the reorg. Kudos to Mayor Rilling and P and Z Director Steve Kleppin! And good news about Lieutenant Blake and Officer Kassimis saving a life in a drug overdose. We know Lt Blake (never met Officer Kassimis as far as we know) and he has been very helpful over the years, along with the entire NPD, in helping control crime and improve quality of life in our community of South Norwalk. Thank you! Long over due!! I will believe when I see it and knowing Norwalk it will be a minor hand slap if anything for the illegal apartment owners. When there is a fire in one of these illegal apartments the city will be sued for not stopping it. They should inspect all 2 family and above apartments. Many of the listed 2 family apartments have 3 and some 4 family’s living in them. Long over due and I hope they start now. This business with illegal apartments is a BIG issue that has been IGNORED for way too long. There are liability issues to the City (that would run in the millions of dollars) as well as property tax issues (these landlords burden us with more residents and more students — thus not paying their fair share of taxes). Enough is enough. The burden of proof here is completely BACKWARDS. The City of Norwalk needs to get this together ASAP — Steve Kleppin, there is no time like the present. Enough dilly dallying. PS School enrollment is bursting at schools where the bulk of illegal apartments are located … so this issue is for real and is costing property tax payers big $. The City needs to go after these landlords YESTERDAY! Zoning regs, based on state statutes limit the number of unrelated people to 6 per unit. It does not speak to related people, which makes sense since it would seem very unamerican to follow a policy that put any government deciding family size. An apartment, by zoning regulation, consists of a unit having both a bathroom and stove. Previous attempts to further define what an apartment consists of was met with outrage by the ethnic community that has long practiced something called “summer kitchens.” I’m curious how a new attempt plays out, now that the sandwich generation is concerned with childcare and elder care. Happy to hear the administration is addressing the issue because during the campaign the mayor said it could not. There needs to be tangible, measurable, legal and financial metrics associated with the clampdown of these apartments – not just press releases. Will that be addressed in the reorganization? @Jlightfield attitude is very important especially when talking about concerns of Norwalk taxpayers and yours is very condescending of late. It is a real problem in Norwalk despite what you may think, illegal apartments are very well hidden and you can’t have good facts because of that. Let the city do the inspections as they should have done 100 years ago on a yearly basis and you might learn the real facts. Zoning regs in Norwalk need to be re-written today by a professional person without political influence. Norwalk is bursting at the seams and we can’t keep going like this. Time for real change. Does anyone know where the biggest concentration of “illegal” apartments exists? Based on school enrollment or other related factors? The bulk of illegal apartments are in central and west Norwalk? The largest elementary and middle school are in West Norwalk. Good news about improving the inspection? Nice try but the way to move on this has many facets that are not listed so for those of us fighting things like illegal apts it falls short of a solution. We need less cheerleaders and more to listen to those with ideas. What if you went to the post office and got names an then had all the cars regs run for a start? Some one renovates without a building permit call the city after the work is done and the city plays stupid , gives plenty of reasons why nothing can be done. We have a new mayor on the way now we have to wait for the election , meanwhile we have cheerleaders who have no clue what big cities do. I don’t hear mall responsibility and city liability if we had outside the box thinking I would nave to warn what sounds like a good idea stinks. The city knows what stench smells like mow we need to act upon solutions at the intellect level. Lets not talk those calls where no one had narcon to use and it was a circus , its insulting to think South Norwalk is the only place overdoses happen .This clearly shows the problem is not black and white. Thanking and kudos to the officers yesterday who took the drug that kills of the street yesterday and showing what the here and now is producing would show more of whats going on than a disconnect to the city we are use to seeing. Thanks NON you always give us enough on the bone after great facts to move towards a resolve within the city , clearly the education you give is half the battle . For those who love facts until the city produced the ones they don’t want anyone to see we have NON to cover our backs. Police logs show great drug busts not in South Norwalk , police logs show bulk of the overdoses not in South Norwalk anyone what too challenge the facts? Im talking just this week . The here and now would be a great place for city hall to start. Outside of their comfort zone and that would help our responders showing them daily support not just at election time. I think “Teacher” is right about West Norwalk, especially. It’s nuts here and getting scary. Houses with 4 or 5 families. Who owns these houses. Banks? Town council made a huge mistake by not utilizing cost effective auto license plate ID techology to catch car tax cheats and this technology could be cost effectively used to convince a judge to issue an order. Who owns all of these cars every night at the same house? Last year our town council stupidly objected to this technology for privacy concerns. Everyone of us already has their VOTER RECORDS!, relatives and addresses online for everyone to see without our permission. Why not use digital to help us preserve out AA neighborhoods and bust tax cheats. Does anyone really know the number of illegal apartments in the City ? Ever rising punitive property taxes and falling housing values encourage illegal apartments especially in lower income parts of the City where affordable housing is scarce. Neither Mayor Rilling nor our previous Mayors have shown much interest in illegal apartments. Without City inspection and quite serious fines the problem will just escalate. The problem of illegal apartments extends behyond the lower income central core. More than a few homeowners in the outlying higher income portions of the City have created illegal (or non-registered) apartments to help defray our punitive propoerty taxes. At face value illegal apartments represent a governance failure at City Hall. So far not much willingness to determine the extent of the problems and means of remediation. Especially with a Mayoral election coming up. Out of sight out of mind seems to be the City Hall approach here. I guess Lisa is starting her campaign again. I’ve been appraising real estate here since the 1980’s and during that time we’ve seen, first hand, the increase in illegal occupation of smaller 2-6 unit apartment houses. By illegal occupation I mean that an apartment is leased to X who then, while often still living there, subleases the various rooms to others. While it use to be that the various rooms were generally occupied by single men (several to a room) in the past decade that has shifted to an entire family in one bedroom. So in effect, a three bedroom apartment could be housing three families. So a three unit apartment building, each with three bedrooms, could potentially be housing 9 families. The tell tale sign is external padlocks on the various bedrooms. From first hand experience I know it’s not an easy problem to solve. If you shut down the Illegals, who will vote for Laoise and Harry? The issue is not about undocumented residents, but landlords cheating the system, safety and devaluing neighborhoods, while the city turns a blind eye. Not only are we losing revenue, but it increases the financial burden for those following the rules. Considering the aggressive confiscation and sell off of properties for those with back taxes (when perhaps a property owner has fallen on hard times) I’m surprised the city has been so lackadaisical towards these property owners who knowingly and purposefully shortchange and overload the system. My neighbor has an illegal apartment. If I read this correctly, I need to find an advertisement for this apartment in order to get the city to investigate? There is a clear link between increasing numbers of illegal apartments, illegal residents, larger numbers of low income families in our de facto Sanctuary City. In a commuter City with a small business sector and relatively few job opportunities for low skilled residents any real effort to reduce the numbers of illegal apartments will become a policy of encouraging removal of lower income/illegal residents. Whether the community is ready to pursue such a policy of “urban removal” remains unknown. Far easier to throw stones at City Hall. And its not just a Norwalk problem. Affects most of CT’s other cities as well. Not Sure How they figure there is no cost here ! Stabbings in South Norwalk last night is not going improve quality of life in our community is it? Mike one Norwalk fire marshal comes from Orange Ct, Rilling forgets who buys the gas. Last count was 6 fire marshal cars all parked in a row at Ct ave. Has Norwalk fire become a dealer of such vehicles? observe and deduct, havn’t got much time to check out the cars they read NON also. Our firefighters need equipment but the chiefs just got a raise now they get almost $200,000 a year. Mr Mayor the fire dept needs equipment they got their raises and new hires what about us and what we need for the firefighters. While I’m at it Norwalk needs shotspotter , Bridgeport just got it and it cost nothing and Joe the mayor works alone. The price of a fire chief opposed to 180,000 was worth the grant money for shotspotter. Agree with Lisa Thompson regarding illegal apartments. ‘Not only are we losing revenue, but it increases the financial burden for those following the rules’. Norwalk’s property taxes are ridiculously expensive. Taxpayers are not getting what they’re paying for. Jackie Lightfield — where are you getting your NPS enrollment numbers from? 1991 enrollment was 9,681 … nowhere near the 15,000 you referred to … our enrollment for the coming school year is forecast at 11,700 … so a 21% increase over 27 years … with a range of fluctuations over that time period. Enrollment had previously peaked at 11,111 in 2011/12.